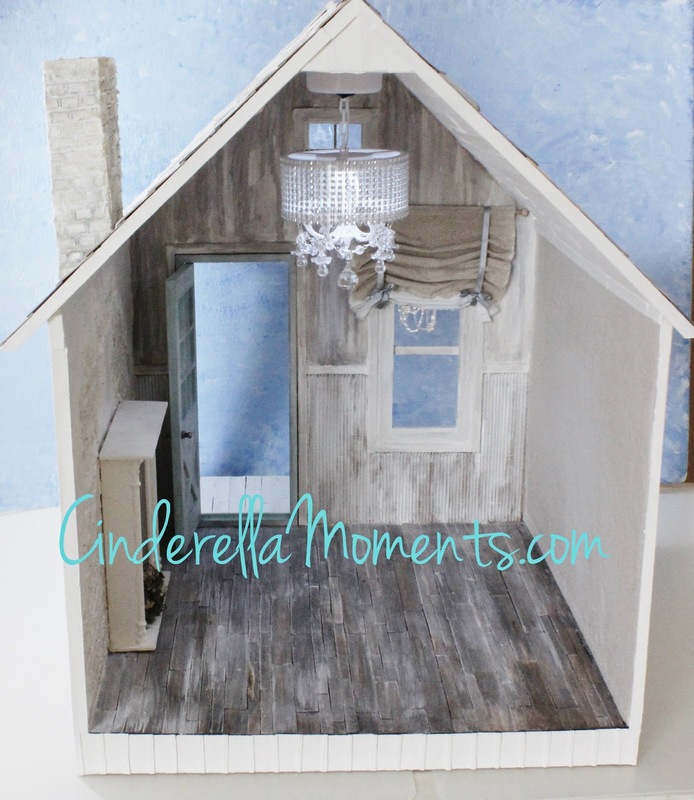 My Blythe dollhouse is also almost done. 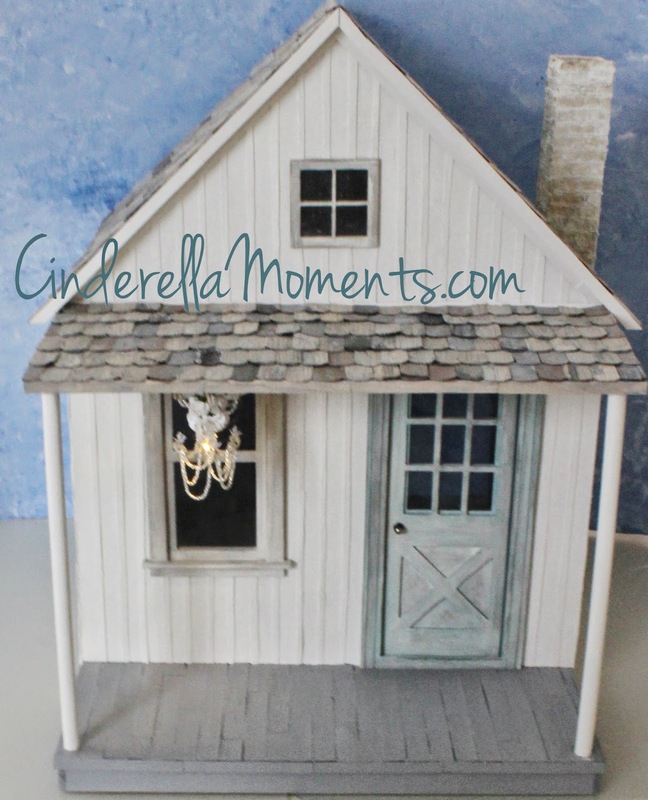 It's a shabby chic style dollhouse 1/6th scale. It's 23 1/2" (59.7 cm) tall x 20" (50.8 cm) x 25" (63.5 cm)deep. 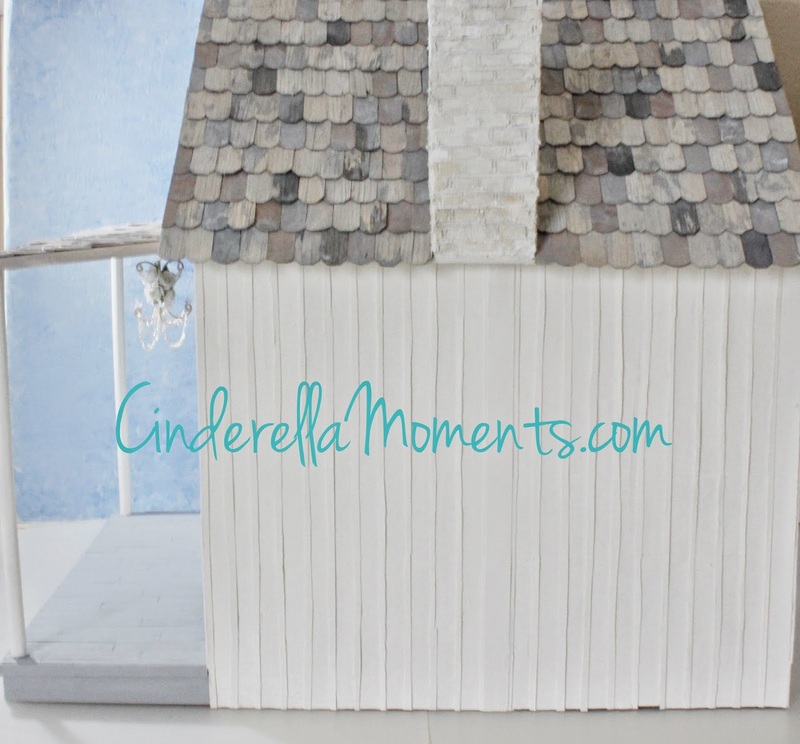 It's a lot bigger than my usual dollhouses! The outside is covered with birch siding. The chimney is concrete carved with bricks. I painted the bricks white, then applied brown ink and re applied white on top while the brown was still wet. 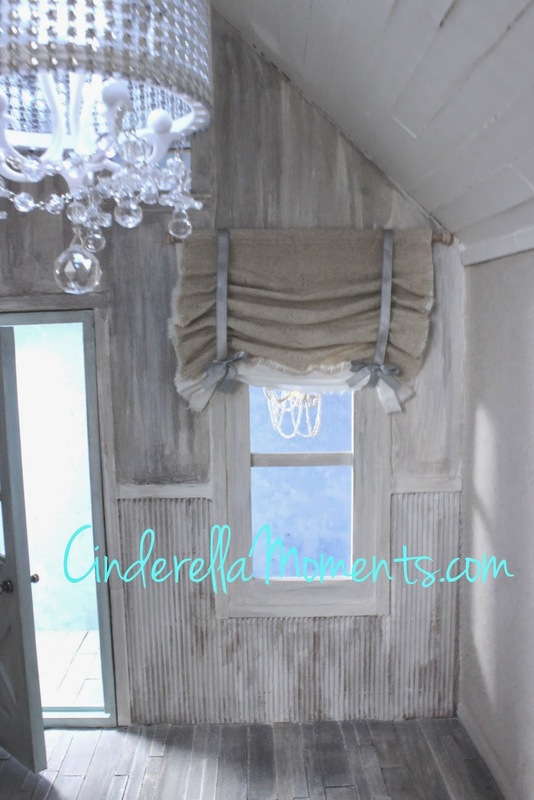 The curtain is from a canvas drop cloth and white cotton fabrics. I finished it off with a gray ribbon. 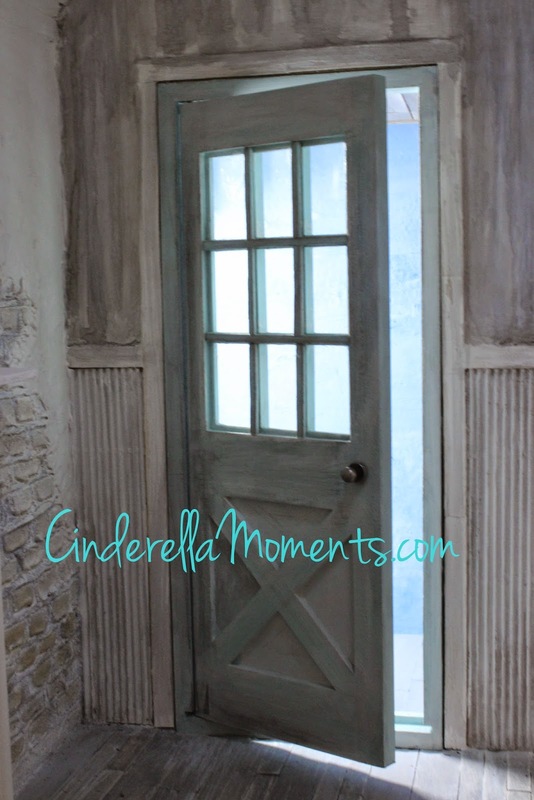 This is a 1/6 scale door. I bought it and the 1/6 scale window so I could figure out the scale of the house. They were a great help! Here's the mantel in place. I put flickering lights inside the logs to have a fire effect. I made 4 "tin" tiles to put behind the logs. And the wall is a mix of fallen plaster and concrete bricks. 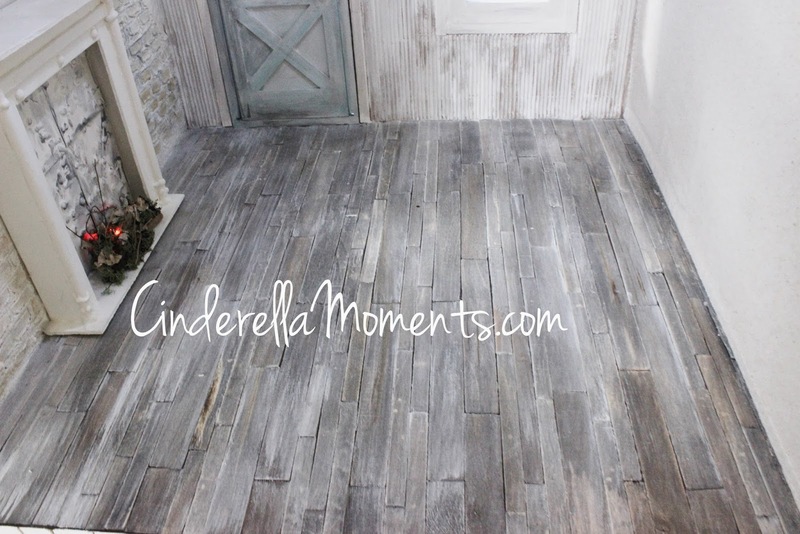 The floor is weathered grey with white highlights. 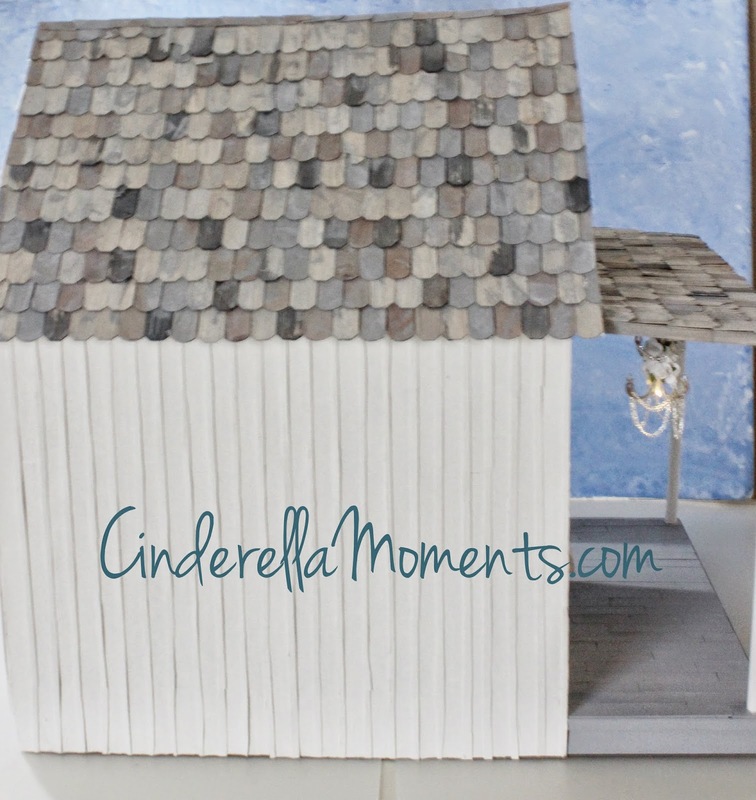 The little window at the top of the front wall is a 1/12th scale window. Works perfectly there! 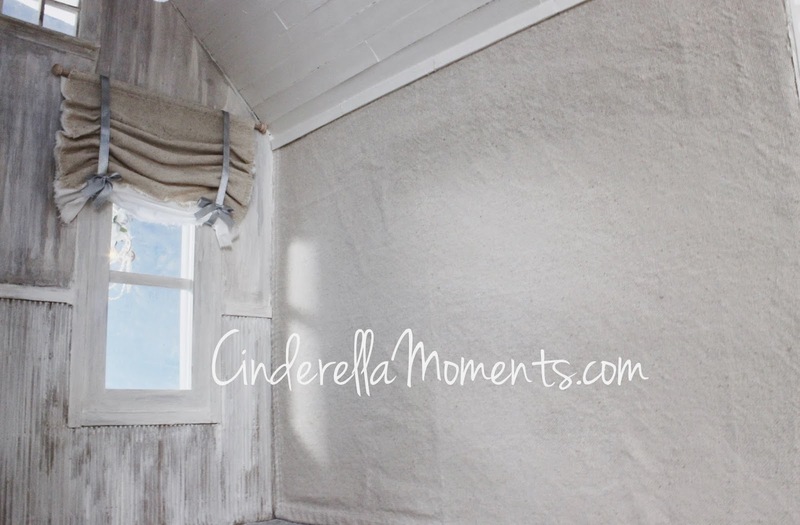 The other wall is covered with canvas fabric. 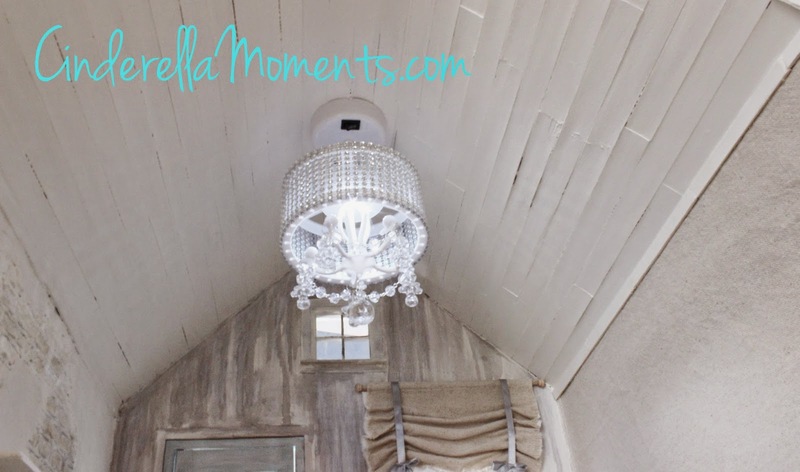 The chandelier can be lit with an on mode or a motion detector mode. Fun! And my Blythe doll is ready! I'll show her to you next time. О, Каролина! Дом фантастический, как всегда! Мне нравится кирпичная кладка возле камина! Очень интересный стиль дома! Amazing! and I feel so great when fully decorated will be beyond amazing! That is one lucky Blythe doll! I love the wall around the fireplace and the chandelier is amazing!!! 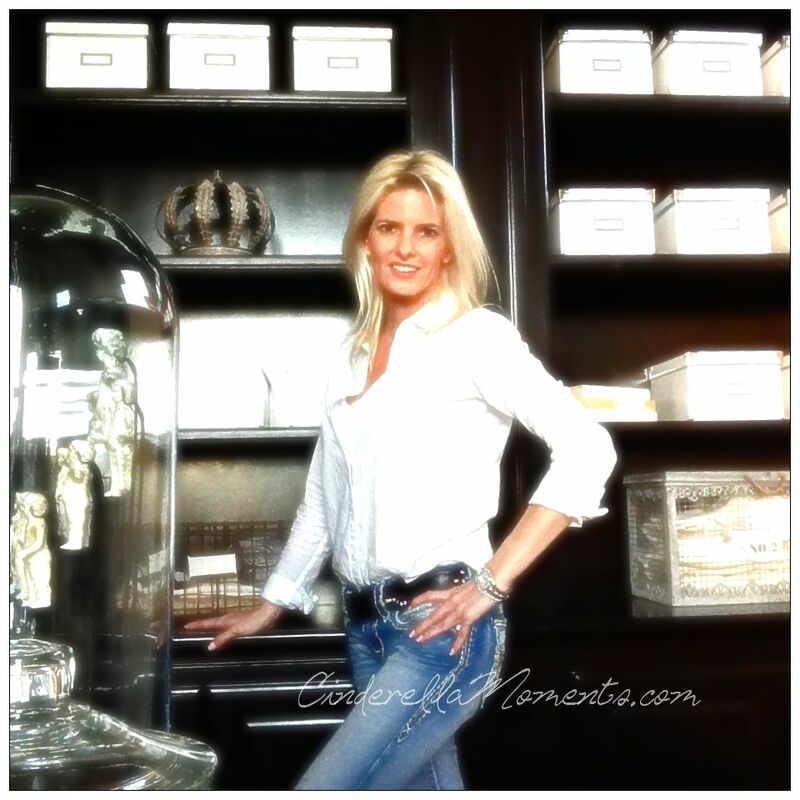 Wow, Caroline , you have outdone yourself, what a beautiful dollhouse :D! I love the detailed work on the bricks, it is amazingly realistic, so well done!! I think your customer will be very happy when she will see the house. Gorgeous! 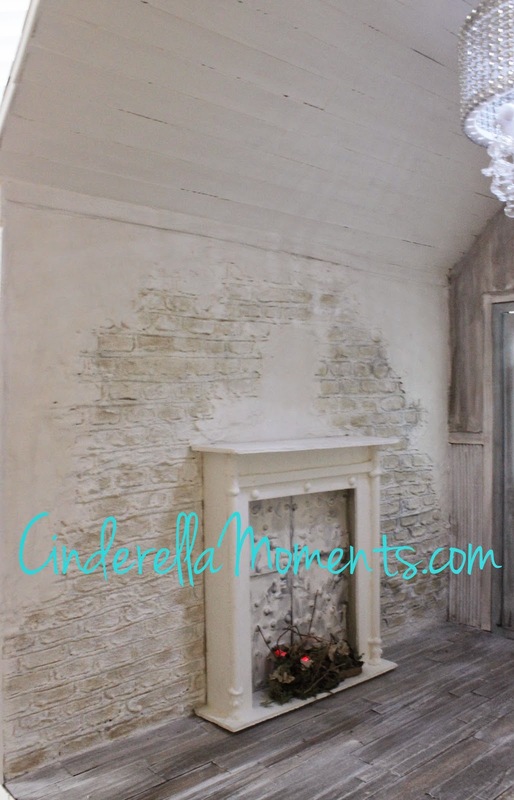 Oh that exposed brickwork around the fireplace is really something beautiful! Another beautiful wonder from you Caroline!! I'm so looking forward to see your Blythe doll completed.....I'm sure she is going to be stunning!!! Big hug! Ha quedado una casa preciosa, seguro que tu muñeca está encantada ahí dentro. I can't wait to see her in her house. I know she's doing to love it. I LOVE the washed out gray and whites. It's very tranquil. It even kind of reminds me of Snow White's cottage in the tv series "Once Upon A Time." 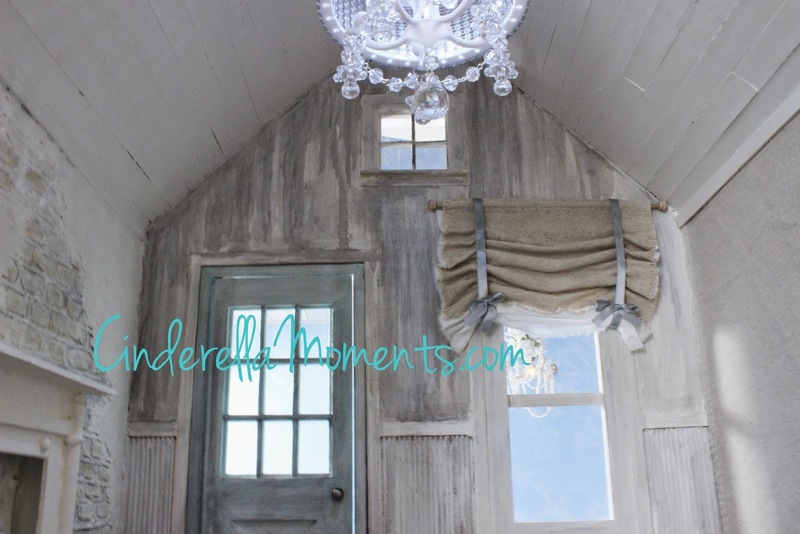 (It, too, has the Shabby Chic gray/white overtones present). Beautiful house. I love the calm colors. Your Blythe doll will love it. Looking forward to seeing her. It is so nicely shabby chic, the colours are very calming and provide a great neutral background to furnishings. I particularly love the effect on the fireplace wall and the aged flooring, oh and the light is beautiful. Great house! I love the chandelier and the curtain. I can't wait to see more and the doll in the house. It's a lovely house, Caroline! The Blythe doll will perfectly at home in it! I love that grey floor! Another amazing house!!! I love the colors, the bricks work, the chemney, the curtains... all, all!